Gara is gaining some momentum after a couple of tough losses. Papp continues to get tough pairings and is having a good tournament despite her loss to GM Donchenko Alexander. Rd. Bo. No. Name FED Rtg Pts. Result Pts. Name FED Rtg No. MTK was in action Jan 22. This was a tough round for the Hungarian contingent. Papp, Kozak and Vaida did well to draw against strong opponents. 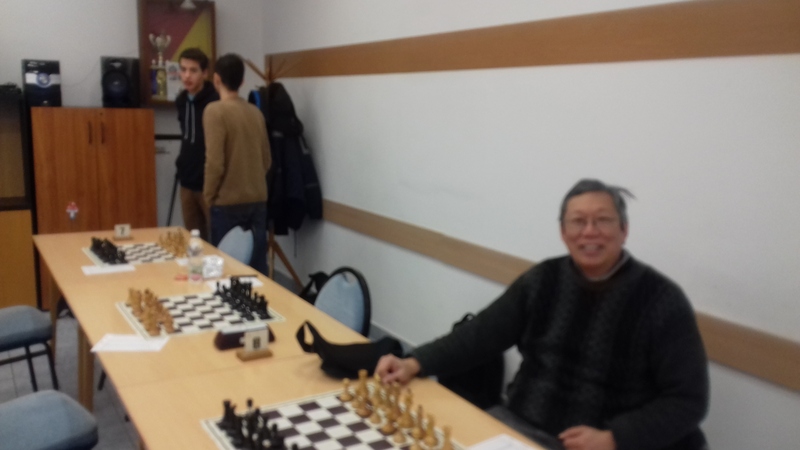 Papp got back on the winning track after a losing a heartbreaking long game to Ivanchuk in rd1. The 6.Qe2 line in the Berlin middlegame is a popular branch. White tried a more modest approach with g3 and c4/Nd5 but could not get much against the solid Berlin formation. White is more active in the centre and has dreams of a kingside attack so how should Black manage the defence? The solid Breyer continues to be a tough nut to crack. White needed some cooperation in the attacking phase but took the necessary risks to get some winning chances. Here are some interesting games from this weeks TWIC issue. Black mismanaged his position after accepting an isolated pawn for activity and was then positionally smothered. The knight is king and the e-pawn a permanent target but what is the plan now? White played a model endgame gambit in the topical Scotch Opening. White has a nice good knight vs bad bishop RN-RB endgame. How to continue? A typical plan for White is f4-f5 and a kingside pawn avalanche. Black must make a key defensive decision early in the game. Black voluntarily opened up his kingside in a sharp chaotic game and now must make a decision about the Bf2. I lost in rather listless and pathetic fashion. My position during the game was not as bad I had initially thought during the post-game analysis. Some things for 1.d4 players. The 4..d6 sideline is an interesting way to avoid the massive theory of the main lines. White took some liberties with the odd Qc1 retreat and then 18.Kh1 just invited a massive attack. The remainder of the game was a comedy errors though. White has the bishops and a nice pawn centre. White is the plan now? White lasted until deep into the ending when the losing blunder was made but certainly had chances in the early going. Black ground out a win by keeping the pressure up. MTK did not have a great day, losing two of three matches today. A Tabáni Spartacus II az 1. táblán ifjúsági játékos kontumálásáért 2 büntetőpontot kapott. The play was sharp and somewhere White missed a tactical shot. Some of my teammates have become slightly camera shy. From this week’s TWIC 1158. Every players’ favorite task is going through relevant repertoire games to stay on top of developments. The 5.Re1 is a very popular way to avoid the painfully equal and solid Berlin Endgame. White won this game after getting some nagging pressure in an equal position. There were some inaccuracies and then blunders decided in the rook endgame. The rook ending is equal but requires precise handling. I will be on MTKIII facing Fabulon tomorrow(Jan 22-2017) in Rd5 of the BTCh. Hopefully this will be enough preparation in case I am Black.